Challenges: Pagemaps #1, color, sew, volume, Hoard-The sticker and tag are ancient. I believe that puffy sticker came from Kimmy as a RAk years ago from the color challenge. The mat behind the picture is from a book I made with Heidi Swapp at Scrapfest MOA years ago. I never finished the book but loved misting class. Super nice catch!! Nice layers. Wow, great catch, and masculine page. Love the strips of paper with the tag tucked in. Great job!! That's a great catch!! I like the papers and the way you chose to layer them. I also like the pine looking branches that you stuck behind the picture. Wow what a great lo! Great job with the colors and sketch. Look at that wonderful fish! Great way to scrap your boy. Love the popping colors. Very eye catching page! The mix of colors and papers is great! That's quite a fish, too! Love the stitching and your design- super cute LO!! Really like the camo paper too!! Great job with the sketch, I really like the fish paper. Great colors! Love the strips of pps! Love that you added the green to the navy and rust! The strips turned out cool!! I love the strips of paper behind the pic. Love the strips of different papers and how the colors go together. Great page! Great colors and design! I love the stitching and pps too! Thanks for playing in the June Sewing Challenge! Great take on that sketch and LOVE the paper strips!! Love, love, love the effect of the paper stripes. It really makes your eyes go to the terrific photo. Love the big smile with the fish! love the randomly place strips of paper for the matting! 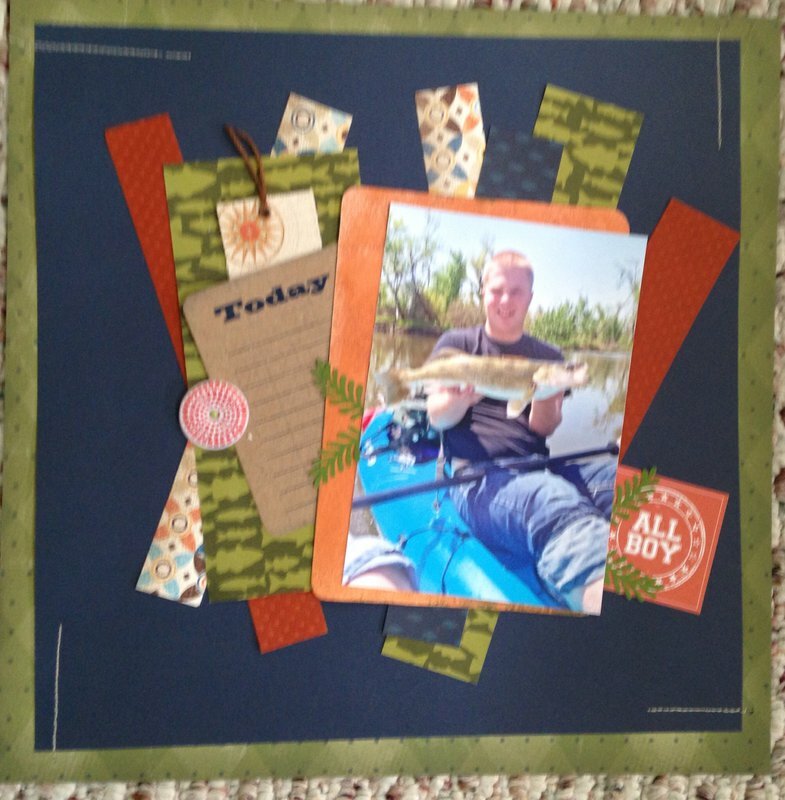 What a catch and what a great guy layout! Wonderful job. I really like your approach to the stitching. Great take on the sketch, too! So cool - love all those strips behind the photo! Fun guy page! Love the angled strips! Fabulous job on the masculine layout! The color challenge is perfectly suited to just this type of topic isn't it! Really love the design of this page! very cool take on that sketch! love the stitching and that you are using up your stash! The colors are great! Nice job with the stitching. Tina, love the colors on this LO. That fish paper is super cute too.